In a remote valley in mid-Wales, lies the village of Pennant Melangell. 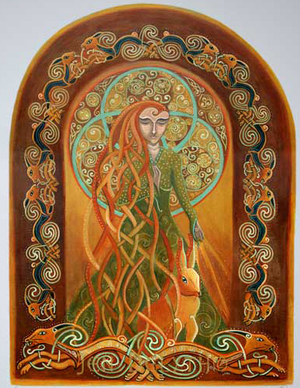 According to legend, in 607 CE an Irish princess was, against her will, arranged in marriage to a local chieftain. She was devoted to God, and so fled across the sea to find sanctuary in the Welsh mountains, where she lived humbly, sleeping on a bare rock in the woods. One day, the local prince Brochfael Ysgythrog - the Tusked - was out hunting with his hounds, when they scented a hare which they pursued into a dense thicket. There to the prince’s surprise, in a sunlit clearing, was the beautiful maiden Melangell, quietly praying as she faced the baying hounds.... The hare had taken refuge amongst her skirts. The howling dogs were crouched, ears flattened, tails between their legs, and the Prince found his horn stuck to his lips, unable to move. Brochfael fell humbly to his knees, impressed by her courage, and recognizing her divine presence. He granted her the valley as a perpetual refuge and place of sanctuary for all people and animals. Hares are still called wyn bach Melangell - or Melangell’s little lambs, and the church of Pennant Melangell contains St. Melangell’s shrine, which is visited by pilgrims today.